Women’s Renaissance Costume Essentials: 3 Favorites Under $50! If you’re like most Renaissance-loving ladies and gents, you could easily spend thousands of dollars if given just a few minutes on a Renaissance costume shopping spree! However, most of us don’t have the unlimited income that would be necessary to fulfill our every Renaissance costume fantasy. The simple fact is, high quality Renaissance costumes can be on the costly side. The upside, of course, is that they look better, feel better, last longer, and have a fine attention to detail. That said, even those of us who work here at Pearson’s Renaissance Shoppe must keep a close eye on our purse strings, investing in costumes we absolutely can’t live without and will wear time and again. Trust me, it’s not easy. There’s temptation at every turn, with every order that arrives! Renaissance Chemise: This terrific white top pairs perfectly with so many pieces, crafted in a comfortably baggy style that is breathable, flattering and feminine. The elastic neckline lets you decide if you’ll wear it on or off the shoulders, while the black bows on the arms are a charming touch. Available in sizes XS-2X, this top looks great on everyone we’ve seen wearing it! Colonial Shoe: If I said I hadn’t worn these to work once or twice I’d be lying! These versatile shoes really take on the look of whatever you wear them with, be ye a pilgrim or a wench. Finding the ideal footwear for every costume isn’t always an option, so I like to have a few pairs of shoes that work with almost anything. I’ve turned to these more than once, and they’ve saved the day and the costume every time. 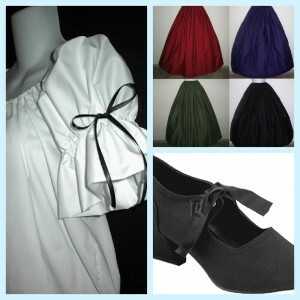 Drawstring Renaissance Skirt: These are absolutely amazing for those scorching summer events that always seem to fall on the most hot and humid days of the year. Currently available in 14 colors of seriously soft, lightweight cotton, these one-size-fits-all workhorses are ready for whatever the day brings! They also layer beautifully for added loft or warmth.